This multiple-choice blood gas quiz is an easier version of a blood quiz posted in 2009. Both blood gas quizzes are based on information presented in my Pulmonary Physiology web sites, especially The Four Most Important Equations in Clinical Practice. These equations are shown below in the box. You will need to understand these simple relationships to properly interpret blood gases. An alternative web site for these four equations is at Clinician's Ultimate Reference. I recommend you answer the each question or set of questions first, before checking the answers. For questions that require any calculation, it is always best to do it on paper rather than in your head. I cannot over emphasize the importance of becoming familiar with relationships expressed in THE FOUR MOST IMPORTANT EQUATIONS (below). When you are ready to check your answers please click here. i.e., PaCO2 is proportional to the amount of metabolic CO2 production over alveolar ventilation. i.e., pH is proportional to the bicarbonate value over the arterial PCO2. i.e., Alveolar PO2 = the pressure of oxygen inhaled minus the PaCO2. The pressure of oxygen inhaled is a function of the FIO2 and barometric pressure. Although not in the equation, PaO2 is a function of the PAO2; it can never be higher than PAO2 (unless the patient is dying) and its value is dependent on both PAO2 and the lung architecture. i.e., The physical amount of oxygen in arterial blood -- the CaO2 -- is a function of: the O2 saturation; how much O2 can bind to hemoglobin (1.34 ml O2/gm Hb); and the amount of hemoglobin in the blood. The value of .003(PaO2) is too small to be of consequence in most clinical situations. When finished with one or more questions, click here for the answers. The most likely acid-base state in this patient? 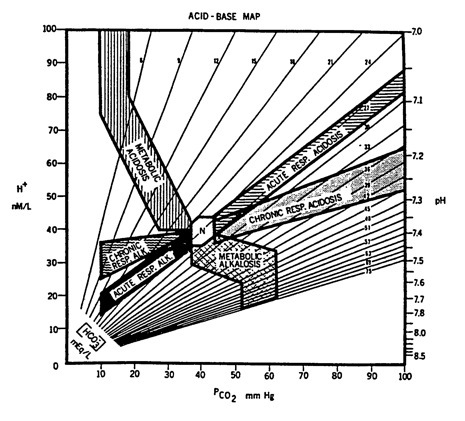 Below is an 'acid base map' that shows the expected bands for each of the primary acid base disorders. By plotting the above pH and PCO2 on this map, you can gain a better appreciation of the patient's acid-base state. This map is also included in several other acid-base questions. Each time, I recommend you plot the pH and PaCO2. In the answer section you will find a link that shows this map with an arrow indicating the acid-base state. a) She is not doing any aerobic exercise. b) She likely has lung disease. c) Her alveolar ventilation (VA) has increased to match her body's CO2 production (VCO2), so the ratio of VA/VCO2 is normal. 3) Which of the following changes will most increase arterial oxygen delivery? What is the most likely acid-base state in the patient? 5) Which one of the following statements is true about SpO2 as measured by pulse oximeters that utilize two wavelengths of light (i.e., most pulse oximeters in use today)? a) SpO2 can be normal even when PaCO2 is >200 mm Hg. b) SpO2 is affected by anemia. c) SpO2 will differentiate oxyhemoglobin from carboxyhemoglobin. 6) Which of the following statements is true about non-arterial assessment of blood gases? a) if venous HCO3 is truly abnormal, the patient has some type of acid-base disorder. c) venous blood cannot be used to diagnose carbon monoxide poisoning. 7) Which of the following is a correct statement? a) If the lungs and heart are normal, then PaO2 is affected only by factors that affect alveolar PO2. b) Anemia will lower the PaO2. c) The reason PaO2 falls with increasing altitude is because FIO2 falls. 8) A patient presents with the following arterial blood gases, drawn on room air (FIO2 = .21). a) The patient does not have an acid-base disorder. b) To determine if there is an acid base disorder you need to know the measured serum bicarbonate, since the HCO3 from blood gases is only a calculation. c) A patient can have normal blood gases if two metabolic acid-base disorders oppose to give normal bicarbonate. Which of the following is the most likely cause of these abnormal blood gases? 10) A 42-year-old man is admitted to the hospital with dehydration and hypotension. No arterial blood gas is obtained. Which statement best applies about this patient's acid-base status? a) Electrolytes indicate the presence of metabolic acidosis. b) Electrolytes indicate the presence of metabolic alkalosis. c) Electrolytes indicate the presence of both metabolic acidosis and metabolic alkalosis. a) His actual SaO2 is much lower than the calculated value. b) There is no lung abnormality present, though pulmonary disease could develop in the ensuing 24 hours. c) He has a mild metabolic acidosis associated with an increased anion gap. Which is the most correct statement? a) B is more hypoxemic because PaO2 is lower than A.
b) B is more hypoxemic because SaO2 is lower than A.
c) A is more hypoxemic because O2 content is lower than B. 13) State which one of the following situations would be expected to lower a patient's arterial PO2. Which statement best describes these values? 15) Which one of the following statements about cyanosis is correct? a) For cyanosis to manifest there needs to be 5 gm% of deoxygenated hemoglobin in the arterial blood. b) Patients with anemia manifest cyanosis at higher SaO2 values than patients without anemia. c) Cyanosis can be caused by excess methemoglobin, which is HbFe+3. 16) Since the early 1980s, climbers have summited Mt. Everest without supplemental oxygen. Since the barometric pressure on the summit is only 253 mm Hg, summiting (without extra O2) has only been possible due to prolonged acclimitization at altitude and profound hyperventilation. Indeed, if a a climber maintained PaCO2 of 40 mm Hg and an alveolar-arterial PO2 difference of 5 mm Hg, what would be his/her theoretical PaO2? 17) Which of the following statements is true about excess carbon monoxide? 18) A mountain climber ascends from sea level to 18,000 feet over a two day period, without supplemental oxygen. With ascent which one of the following should alaways decrease? 20) While the following conditions could possibly be managed without measuring arterial blood gases, in which one would blood gases be most helpful? a) A 17-year-old-high school student who presents to the ED with hyperpnea and tachypnea; history reveals he became "excited" during a church service. He has some tetanic contractions of his hands, his lungs are clear and pulse oxygen saturation is 98% on room air. 21) Which of the following is not a component of the PaCO2 equation? 22) The limit of human hyperventilation is a PaCO2 of about 8 mm Hg. What is the highest PaO2 (mm Hg) a patient with normal lungs could achieve breathing room air (FIO2=.21) at sea level? 23) A 45 year-old-man is treated in a hyperbaric chamber for severe carbon monoxide toxicity. Assume he is breathing 100% oxygen at 3 atmospheres of pressure, that he has normal lungs, and that hemoglobin=15 gm%, carboxyhemoglobin=40%. What is his approximate arterial oxygen content in ml/dl? 24) Which one of the following statements is true? a) If nothing else changes, as PaCO2 goes up alveolar PO2 and arterial PO2 go down. b) PaO2 is inversely related to blood pH: as pH goes up PaO2 also increases. c) If PaCO2 increases while HCO3- remains unchanged, pH also goes up. Click here for answers to the above quiz. Click here for the harder Blood Gas Quiz.